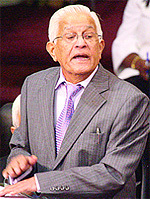 The Leader of the Opposition, Basdeo Panday, recently laid a motion in Parliament seeking for HCU depositors to be granted a ‘bailout’ of the kind given to those who had invested with the failed CL Financial group. On Friday 30th October, the Minister of Finance made a major statement to Parliament, seeking to defend the government’s actions in the cases of these two failed Financial Institutions. In terms of race, politics and finance, that statement by the Minister deserves our most sober consideration. Before going further I need to make two things clear – firstly, I am not intervening on behalf of Mr. Harry Harnarine or the HCU. I am not a supporter of that cause. Not at all. Secondly, I do not support the bailout of either group – CL Financial or HCU. The idea that State resources should be deployed to assist investors who have lost money is a dangerous one. As a matter of principle, the concept of moral hazard has real weight in economic behaviour. The idea that investors should be rescued without paying the consequences of their choices is inimical to proper development. That general principle has been done violence by the CL Financial bailout. As I have stated in my previous articles on this bailout, the record of the government in terms of separating the interests of depositors, policy-holders and shareholders is turbid. The Minister’s rationale was set out in two limbs – the first being that the HCU dealings were not straightforward – indeed, one newspaper carried the headline ‘Devious HCU’– and secondly, that the CL Financial dealings were marked by “…tangible co-operation…”. This bailout is an extremely serious act being carried out by the government in breach of fundamental principle and we deserve nothing but the truth. There are deep contradictions on every single point cited by the Minister to support the actions taken. Ample collateral – The Minister is reported to have said that HCU failed to offer ample collateral to the State. The Central Bank Governor is reported to have said, on 7th April, that all of CL Financial’s assets were otherwise committed – This was reported at http://guardian.co.tt/business/business/2009/04/08/govt-left-empty-handed-cl-financial-bailout. The Ernst & Young report – The Minister is also quoted as saying that “The auditors’ assessment was that the Hindu Credit Union was facing not a liquidity problem, but a solvency problem and all its assets were overestimated in value and encumbered.” As a rationale for the government’s actions, that is completely at odds with the 7th April statement of the Central Bank Governor. In fact we were told that the CL Financial group and various of its parts were being examined by Ernst & Young, KPMG and Bob Lindquist, the renowned forensic accountants. To date, no results of those accountants’ work have been released. We are being told that the CL Financial chiefs showed “…tangible co-operation…” in their dealings, so where are the audits? Why has the 2008 audit of the CL Financial group by PriceWaterhouseCoopers not been published? Obviously, some one of the major players is not levelling with us. So the government bails out policyholders and depositors of the CL Financial group. That is widely welcomed, except for a few objectors, like myself. It seems to me that the interests of the CL Financial shareholders have been promoted in preference to those of the taxpayer. I am subject to correction, but if that is so, it would be a monumental mis-allocation of public funds and a seriously questionable act. The terms of the bailout are now being deliberately concealed from public view, although it is at our expense and supposedly being carried out for the benefit of the public. That secrecy is toxic to notions of transparency, accountability and modernity. I will return to that secrecy issue. Suffice to say that the terms of the bailout, the subsequent revelations and the concealment of the second MoU have combined with the Minister’s contradictory statement to yield a very unhealthy series of precedents. The unspoken question at this moment is ‘Who is next?’. Last week’s BG View editorial highlighted some pertinent concerns as to the health of private pension plans and the strength of the regulatory process.